Now in their 26th year, this annual fundraising event brings food and beverage vendors together for a great cause. The 26th Annual Taste of the Town event will take place in Santa Clarita once again this Sunday, May 4th, from 1PM-5PM. Taste of the Town will take place at Mann Biomedical Park in Valencia (See map below). This is an Adults Only event with general admission is $75 and includes all food and beverages. There will also be a “Diamond Drop” raffle where the winner will take home a one carat diamond. Another contest gives participants a chance to win a Hawaiian cruise courtesy of Princess Cruises. For nearly 40 years, The Child and Family Center has helped adults and children in Santa Clarita by providing mental health and substance abuse services on a sliding fee scale and facility payment assistance to help cover the cost of treatment. Last year’s Taste of the Town event raised over $220,000 for The Child and Family Center. 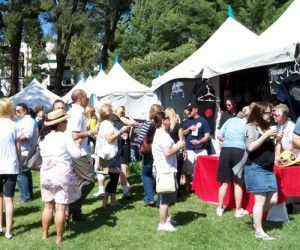 Get more information and order tickets by going to TasteOfTheTownSCV.com.